Welcome to the Mistweaver Monk specialization information page for the upcoming expansion – World of Warcraft: Legion. We hope to keep this summary page updated with new information as it comes to hand. Mistweaver Monk is the only healer available for testing on the Legion Alpha at the moment, so here we have a video of the spell effects for the Mistweaver Monk. Some are old, some have changed and some are brand new. Check it out below! *Remember, this is Alpha and all effects, spells, tooltips and details are subject to change. We have got a very early preview of the Monk Class Order Hall, The Wandering Isle. We’ve already seen this while leveling up our Pandaren, but this will be a great place to hang out as a Mistweaver Monk! 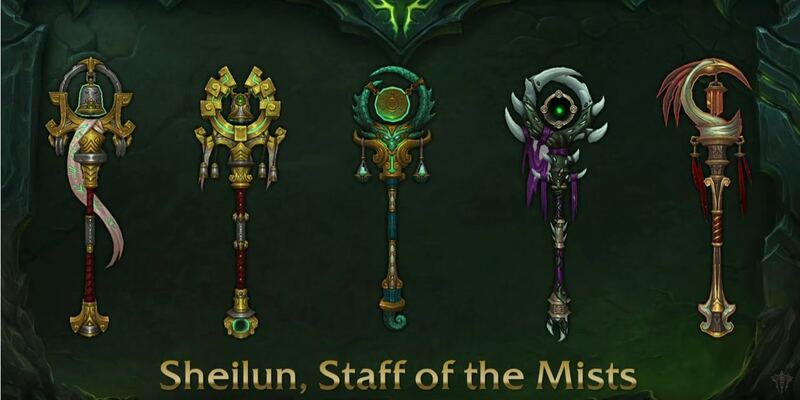 Sheilun, Staff of the Mists has been through many trials in the bid to protect the lands of Pandaria. In the hands of the right Mistwalker Monk, it could aid in turning the tide against the Burning Legion. During last pandaren emperor’s reign, a prophecy arose that a ruthless Legion would invade the world of Azeroth and leave it shattered. To save his people, Emperor Shaohao embarked on a series of trials, taking with him the ancient staff Sheilun. Afterwards, he used his newfound wisdom to become part of the land. He made Pandaria into a separate continent and enshrouded it in mist to protect it. His staff clattered to the ground, where it lay until the monks of Tian Monastery found it and took it to the Terrace of Endless Spring for safekeeping. Originally published on August 11th, 2015 by HealingWoW on HealingWoW.com, Last modified: June 8th, 2016 .